A profound mystery is at the heart of this magnificent new novel by Yiyun Li, "one of America's best young novelists" ("Newsweek") and the celebrated author of "The Vagrants, "winner of the Hemingway Foundation/PEN Award. Moving back and forth in time, between America today and China in the 1990s, "Kinder Than Solitude" is the story of three people whose lives are changed by a murder one of them may have committed. As one of the three observes, "Even the most innocent person, when cornered, is capable of a heartless crime." When Moran, Ruyu, and Boyang were young, they were involved in a mysterious incident in which a friend of theirs was poisoned. Grown up, the three friends are separated by distance and personal estrangement. Moran and Ruyu live in the United States, Boyang in China; all three are haunted by what really happened in their youth, and by doubt about themselves. In California, Ruyu helps a local woman care for her family and home, avoiding entanglements, as she has done all her life. In Wisconsin, Moran visits her ex-husband, whose kindness once overcame her flight into solitude. In Beijing, Boyang struggles to deal with an inability to love, and with the outcome of what happened among the three friends twenty years before. Brilliantly written, a breathtaking page-turner, "Kinder Than Solitude "resonates with provocative observations about human nature and life. In mesmerizing prose, and with profound insight, Yiyun Li unfolds this remarkable story, even as she explores the impact of personality and the past on the shape of a person's present and future. 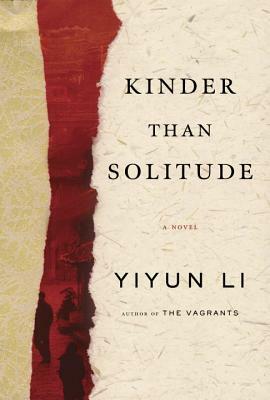 Praise for "Kinder Than Solitude"
"Yiyun Li infuses the traditional form with a fresh, rigorous beauty and a sense of permanence and increasing value."" --"Mona Simpson, author of "My Hollywood"
" A] sleek, powerful novel about the weight of memory, the brunt of loss and the myriad ways the past can crimp the soul . . . Li gives us gifts of gorgeous prose. . . . Rarely are ordinary humans given such eloquent witness." --"The Washington Post"
"What makes "Kinder Than Solitude"] so vivid is its humanity. . . . It is an inquiry into how the past scars us, shaping present and future, and some deeds, once committed, can never be undone."" --Los Angeles Times"
" Li's] true gift . . . is old-fashioned storytelling and] a sense that a life, a whole life, can be captured on pages."" --The Boston Globe"
"A stunning, dark, and beautiful book . . . Yiyun Li writes with characteristic genius." --Paul Harding, author of "Tinkers" and "Enon. Yiyun Li is the author of "A Thousand Years of Good Prayers, The Vagrants, "and" Gold Boy, Emerald Girl." A native of Beijing and a graduate of the Iowa Writers' Workshop, she is the recipient of a MacArthur Foundation fellowship, the Frank O'Connor International Short Story Award, the Hemingway Foundation/PEN Award, the Whiting Writers' Award, and the "Guardian" First Book Award. "Granta" named her one of the best American novelists under thirty-five, and "The New Yorker "named her one of twenty U.S. writers under forty to watch. Her work has appeared in "The New Yorker, A Public Space, The Best American Short Stories, The O. Henry Prize Stories, " and elsewhere. She teaches writing at the University of California, Davis, and lives in Oakland, California, with her husband and their two sons.